Magnus Larsson 2 years, 5 months ago. UMI Super CM13 (CyanogenMod 13) Marshmallow Custom ROM is an UNOFFICIAL Android Marshmallow build for UMI Super. In addition to this we also have the Lineage OS 13 for UMI Super. This UMI Super CM13 (CyanogenMod 13) ROM is brought to you by developer flo071, another ROM by primo3 and another is developed by joe2k01, Rometheus, Flounderist, Deepflex. Current status of this ROM is UNKNOWN. It is strongly recommended that you take either a NANDROID backup or take a complete sync of your phone data. TWRP recovery for the UMI Super. Download link taken from here. Make sure that you have a custom recovery installed on your UMI Super. If not then download the recovery from above downloads section and you can follow this How to Install TWRP on a mediatek device guide. Download and Copy the GApps and UMI Super CyanogenMod 13 ROM ZIP to your phone. Reboot and Enjoy the CyanogenMod 13 Marshmallow ROM on your UMI Super. 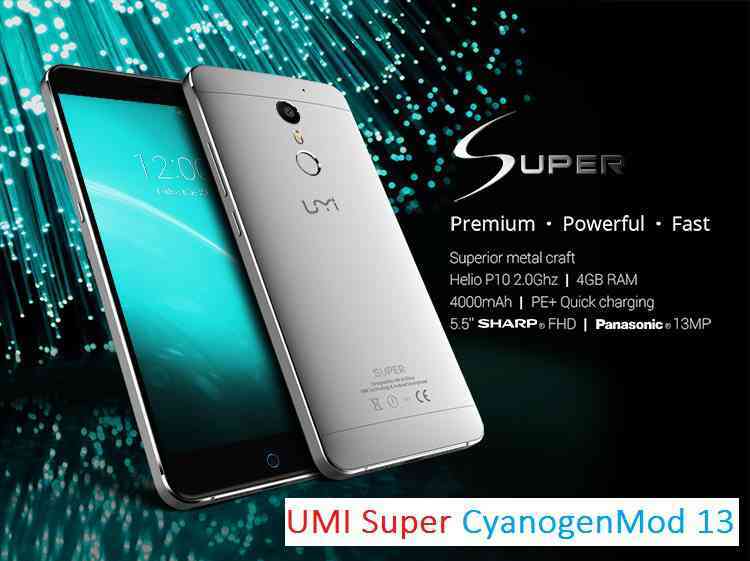 Copy the latest UMI Super CyanogenMod 13 ROM ZIP file to your phone. Stay tuned or Subscribe to the UMI Super forum For upcoming Android Nougat ROMs, CyanogenMod Custom ROMs, other ROMs and all other device specific topics. And is it possible to configure indekator events and switching between virtual and normal buttons? I don’t know if CyanogenMod has any settings to switch between Virtual and Normal keys !!! You need to check the same in settings. It’s a long time ago i change rom in a phone but after buy a Umi Super it’s nesesery again. Now i have try many time with rome below and folow described but have some problem. TWRP Recovery don’t work! In boot mode wite TWRP Recovery screen don’t work! If i press in one place its press in another, all screen its crazy. After try many TWRP recovery files from different sites i found someone who work and finally can start flash new rom. I follow all steps for change to CM13 and all work fine (but even gapps file below dont work) but after reboot it’s the screen similar I described earlier! Touch screen don’t work, It’s not press where i want! It’s not possible do something! Trying many time with Rom from different makers. Only way it’s flash back orginal UMI Rom again.